Childhood curiosity has become a life-long pursuit for Ignazio Lucenti. This Milan-based artist uses mathematics and computation to explore the fundamentals of motion. Curiosity fuels Milanese motion designer. Computational tools facilitate mathematic dissection of motion principles. Algorithms create riveting art almost by magic. What do you get when you combine motion and graphic design with algorithms, web development, and art? Italian Ignazio Lucenti knows. Lucenti is the art director and motion designer at the Recipient Collective in Milan, Italy. His works range from short animations to large architectural mapping and interactive installations. As a young boy, Lucenti spent much of his time discovering how things work. When not writing basic code on his Commodore 64, he was disassembling and rebuilding mechanical toys. This curiosity has carried through into his career. Three of Lucenti’s works stand out from his portfolio, precisely because of this mathematical dissection. Portait of an algorithm. 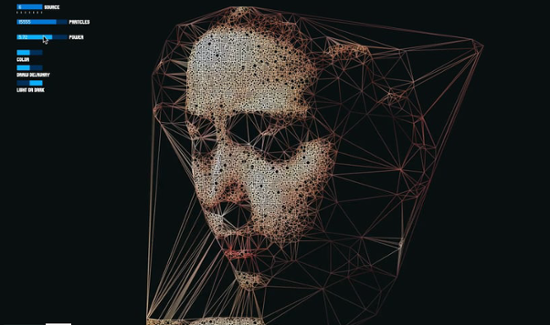 In this sketch, particles are created randomly above an image. The probability of each particle’s creation is a function of the color value of the pixel in that location. Courtesy Ignazio Lucenti. Delaunay Portraits is an experiment on probability distribution. For this piece, Lucenti created a graphical user interface (GUI) that generates random points on a canvas. The probability of each generated point depends on the brightness values of the underlying image. The user can play with the interface, creating different kinds of distribution curves (e.g. linear, quadratic, cubic), and testing the different visual representations of each distribution. The points are linked together by the Delaunay triangulation algorithm, which is a way to link points without overlapping. Phun with physics. Inspired by the Nature of Code, this experiment plays with verlet physics and spring-connected particles. Courtesy Ignazio Lucenti. Verlet Physics and Springs displays software that perceives movements of a dancer through computer vision techniques, translating them into forces applied to digital strings. Lucenti swapped the integration method (the algorithm by which accelerations and velocities are calculated for each frame) from the Euler integration to the Verlet integration to achieve his result. “The latter, being more precise and less inclined to explode, allowed me to simulate sticky threads,” he explains. “Each point had to check each other point, increasing the complexity with a quadratic curve.” From this random distribution of points emerges a beautiful, web-like structure. Computational magnetism. Two new magnetic particles are born every 100 frames, then mapped onto the image of The Three Graces by Antonio Canova. Courtesy Ignazio Lucenti. The Three Graces explores the problems of complexity. All particles are coded to repel each other, avoiding collision. Each particle calculates its distance related to all other particles, selects the nearest ones, and calculates a force to get away from them. For this work, Lucenti implemented a quadtree structure, a k-d tree structure, and a simple grid structure. For each particle, only its current and the surrounding eight cells are checked. Lucenti’s works show how complex patterns and behaviors can evolve spontaneously from very basic principles. “There’s something magical in that, something that reflects the complexity of the world and the mystery of life itself,” says Lucenti.